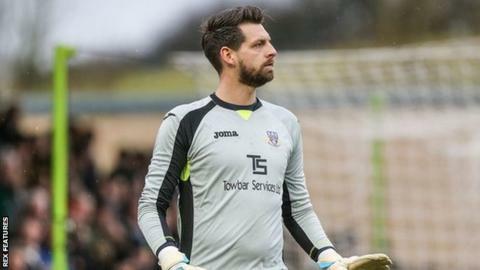 Relegation-threatened Halifax and play-off chasing Eastleigh played out a goalless draw in their National League game at The Shay. Eastleigh goalkeeper Ross Flitney was in fine form, denying Jordan Burrow and then Shaquille McDonald. Flitney also tipped James Bolton's header wide of the post, before preventing Richard Peniket from breaking the deadlock. And Eastleigh's Matt Tubbs could only strike wide late in the game. The result leaves Halifax in the National League relegation zone on goal difference only and Eastleigh sit one place outside the play-offs in sixth, also on goal difference, with two games remaining. Match ends, FC Halifax Town 0, Eastleigh 0. Second Half ends, FC Halifax Town 0, Eastleigh 0. Attempt saved. Jack Midson (Eastleigh) left footed shot from outside the box is saved. Danny Hattersley (FC Halifax Town) wins a free kick. Attempt missed. Matt Tubbs (Eastleigh) right footed shot from the left side of the six yard box misses to the left. Attempt missed. Connor Hughes (FC Halifax Town) right footed shot from outside the box is too high. Substitution, FC Halifax Town. Danny Hattersley replaces Josh MacDonald. Attempt missed. Josh MacDonald (FC Halifax Town) right footed shot from the right side of the box is too high. Substitution, FC Halifax Town. Waide Fairhurst replaces Richard Peniket. Substitution, FC Halifax Town. Connor Hughes replaces Shaquille McDonald. Foul by Josh MacDonald (FC Halifax Town). Substitution, Eastleigh. Jack Midson replaces Yemi Odubade. Attempt saved. Richard Peniket (FC Halifax Town) header from the centre of the box is saved. Assisted by Josh MacDonald. Attempt saved. James Bolton (FC Halifax Town) header from the left side of the box is saved. Michael Green (Eastleigh) is shown the yellow card for a bad foul.